News » Rubin Law Group, Ltd.
For the 7th straight year, Mr. Arnold G. Rubin of Rubin Law Group, Ltd. has been named by his Illinois peers as the state’s top workers’ compensation lawyer. The results of the survey, conducted by Law Bulletin Publishing Company and its Leading Lawyers division, appeared in the March 2016 edition of Leading Lawyers Magazine. To read an announcement, click HERE. To view Mr. Rubins acknowledgement by Leading Lawyers Magazine, click HERE. Mr. Arnold G. Rubin received letters from Governor Bruce Rauner and Joann M. Fratianni, Chairman of the Illinois Workers’ Compensation Commission, expressing their gratitude for his years of dedicated service on the Illinois Workers’ Compensation Rules Committee. Rubin Law Group has received a Tier 1 recognition in the 2016 U.S. News Best Lawyers® Best Law Firms listing for excellence in Workers’ Compensation Law – Claimants. This award marks the second year that Rubin Law Group has been awarded a top-tier spot in the Chicago metropolitan listing. Awards were given in practice areas at both metropolitan and national levels. To be eligible for a ranking, a firm must have a lawyer listed in The Best Lawyers in America, which recognizes the top four percent of practicing attorneys in the U.S. To achieve a Tier 1 ranking – the highest tier awarded – a law practice must receive consistently high levels of respect from both other leading lawyers and clients in the same community and in the same practice area. The National and Metro Tier 1 rankings will be published in print in the Sixth Edition of "Best Law Firms" – available online November 2 and in print mid-December. 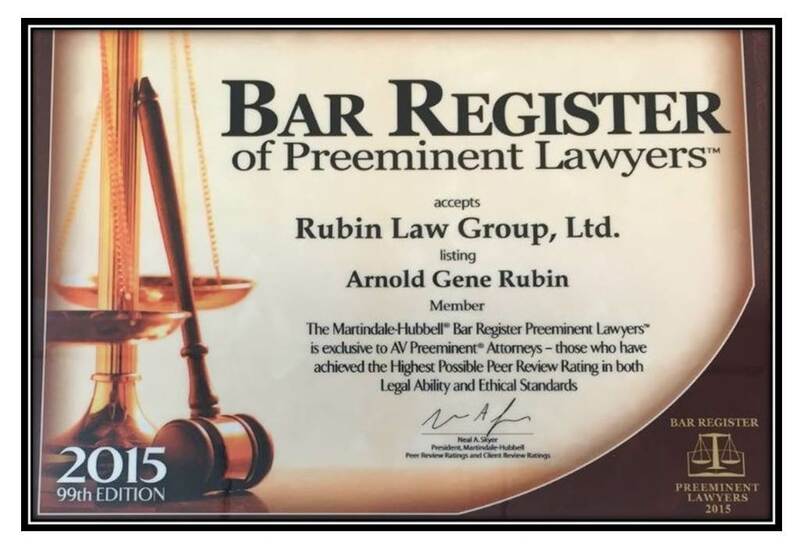 Arnold G. Rubin of Rubin Law Group, Ltd. has been named to the 2015 Martindale-Hubbell® Bar Register of Preeminent LawyersTM. The Bar Register is a definitive guide to the nation’s most preeminent and respected law practices. Only law practices rated as preeminent by colleagues in their field and that have earned the highest rating in the Martindale-Hubbell Law Directory are included in the Bar Register. Arnold G. Rubin of Rubin Law Group, Ltd. previews the discussion on the use of the intoxication defense in workers’ compensation cases that will take place at the 2nd Annual Illinois Institute for Continuing Legal Education (IICLE) Workers’ Compensation Law Institute on February 23 & 24, 2015. Catherine K. Doan will also present on the topic of Social Media in workers’ compensation law. Mr. Rubin named as the #1 Workers’ Compensation Lawyer in Illinois for 2015 based upon the surveys conducted by the Leading LawyersSM. 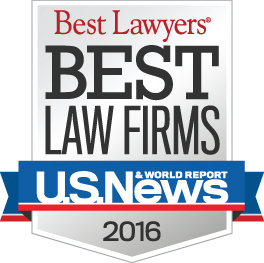 Rubin Law Group, Ltd. has received Tier 1 Rankings in Workers’ Compensation in the 2015 Best Law Firms directory by U.S. News – Best Lawyers®. The 2015 rankings are based on the highest number of participating firms and the highest number of client ballots on record. To be eligible for a ranking, a firm must have a lawyer listed in The Best Lawyers in America, which represents the top four percent of practicing attorneys in the United States. Ranked firms, presented in three tiers, are listed on a national and metropolitan scale. Receiving a tier designation reflects the high level of respect a firm has earned among other leading lawyers and clients in the same communities and same practice areas for their abilities, their professionalism, and their integrity. Achieving the highest tier, Tier 1, signifies a quality law practice and breadth of legal experience and knowledge. Consistently impressive ratings are required from both clients and peers. Arnold G. Rubin was recently selected by his peers for inclusion in The Best Lawyers in America© 2015 in the field of Workers’ Compensation Law – Claimants. Mr. Rubin was also named the Best Lawyers© 2015 Workers’ Compensation Law – Claimants "Lawyer of the Year” in Chicago. Attorney Arnold G. Rubin was quoted in a Chicago Daily Law Bulletin article dated April 18, 2014 about his representation of an ironworker injured in the August 19, 2005 collapse of a bridge at the junction of Interstate 80 and Interstate 294 that resulted in the death of another ironworker. A complete account of the settlement is available in the April 18 edition of the Chicago Daily Law Bulletin. Arnold G. Rubin is pleased to announce that Ms. Catherine Krenz Doan has been named a Partner in the firm. Arnold G. Rubin was recently selected by his peers for inclusion in The Best Lawyers in America© 2014 in the field of Workers’ Compensation Law – Claimants (Copyright 2013 by Woodward/White, Inc., of Aiken, SC). Illinois Institute for Continuing Legal Education (IICLE) facilitated a program titled The Imact of Workers’ Compensation Reform. Mr. Arnold G. Rubin presented on medical issues in the reform policies and answered questions during the final discussion panel. Mr. Rubin named as the #1 Workers’ Compensation Lawyer in Illinois for 2011 based upon the surveys conducted by the Leading Lawyers Network. Illinois Institute for Continuing Legal Education (IICLE) hosted a discussion on Illinois Workers’ Compensation Reform with Mr. Arnold G. Rubin and Mr. Lou Cohn.